Mizoram is one among the Northeastern state of India. Mizoram have a distinct food culture and its quite different from other cuisines of India. Traces of Chinese food culture and north Indian style of cuisine find its presence in Mizo food culture.Non Vegetrian delicacies are most popular of the Mizo cuisine eventhough vegetables are quite eaten by the local population but non vegetarian item is a must in their meal. Rice is their staple food served with both vegetarian and non vegetarian dishes. Bamboo shoots and local herbs are the vital ingredients of their cuisine. Mizo cuisine is basically simple, with less pices in nature this cuisine tastes delicious.They cook their foods with either boiling and steaming, the common spices used are ginger, garlic,onions and chillies. Mizo people dont have dessert after having their meals, instead of that they prefer having fresh fruits after their meals. Zu or tea is the popular beverage, locally made wines are relished by natives and thee Lubrusca grape wine is very popular. Among the popular items are Bai, a combination dish of boiled spinach, pork and bamboo shoots is prominent. Sawchair is another well-liked dish prepared from rice and pork or chicken. Vawksa Rep or Smoked Pork is enjoyed by the people very much. It is a dish made from cubes of pork smoked in an open fire to lend it a unique smoky taste and flavored with bamboo shoots and local herbs. Arsa Buhchiar or Chicken with sticky rice is a common dish where a whole chicken is roasted in open fire and then cooked with a combination of sticky rice and local herbs. Misa Mach Poora is a shrimp delicacy popular in the state. Panch Phoron Tarkari is a delightful item to taste. Poora Mach and Koat Pitha are also famous dishes of the Mizo cuisine.I chosed to prepare Koat pitha, a deep fried banana cake which goes for easy ingredients and quick preparation.You can enjoy this deep fried cake with a cup of tea for your evening snacks, these koat pithas are seriously very addictive and even my kids loved it very much. Take the jaggery and mashed bananas together in a bowl, mix well. Add in the rice flour and mix everything to make a smooth batter. Heat oil for deepfrying in high flame, put the flame in simmer. Drop a spoon of this mixture to oil and fry until they turns golden brown. Drain the excess of oil with a paper towel. Seriously very easy to make snack with less ingredients too.love to travel to all regions after hearing your detailed posts . Delicious n easy to make. Priya, though I wanted to make this, got scared wondering how it might be, you have tried with such ease..the pithas look so good..
yummy and a mouthwatering snack, with very few ingredients. Yummy !!! This Koat pitha sounds so much like Malpua but the latter makes use of flour instead of rice!! I wouldn't have thought these are made with rice and bananas. They look delicious! Interesting dish..finally we have plenty of dishes from this state.. The fritters look yummy and crunchy. Nice one. Beautiful golden brown color. Looks yummy and so easy to make.. I never knew about Mizoram cuisine before.. Thanks to your blog get to know so many diverse cuisine from India. Hats off to you Priya for your energy to cook so many new dishes and blog! I have not even heard half of what you are currently posting, looks like a yummy snack! that is such an easy one!!! you have made it so beautifully priya!! Loved them. I made them for Nagaland. yummy! yummy! I am travelling with you to all the places akka!! Love the color you got there. I tried them for another state. wonderful snack.. love anything deep-fried. these look amazing.. 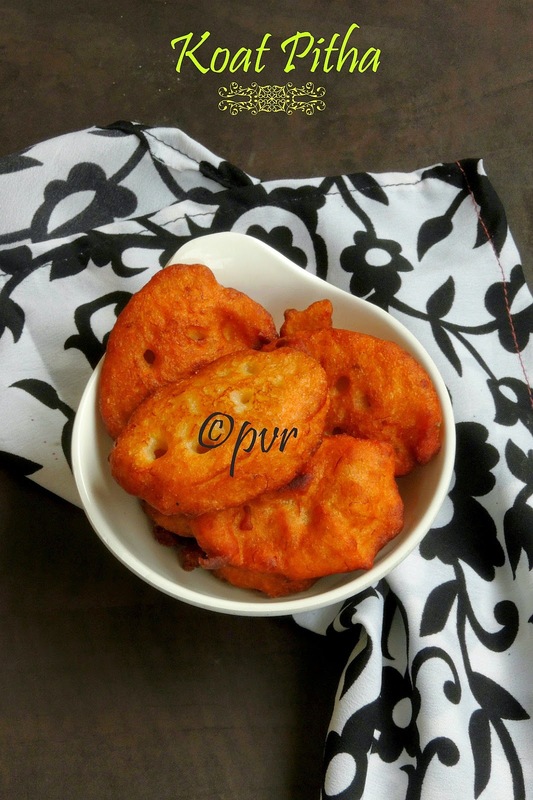 This look like our kachayam but with rice flour!So brave of you to try this recipe! This is like malpuas.. I have made banana malpuas in the same way. A very interesting recipe a little bit like the Chinese banana fritters only you don't mash the banana in that. Very very delicious koat pitha , i wud love to grab some right away :) looks very tempting !! Looks so deliciously yummy and hardly any ingredients. Wow love it.